Not everyone can be characterized as a "born leader." However, we live in a society that desparately needs Christian leaders. 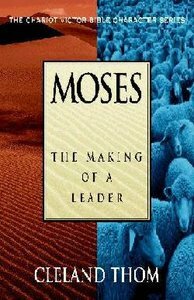 Through studyng the life of Moses, readers will see how they can become leaders shaped by God. Even though Moses fled from his posotion of leadership in Egypt and gave God every excuse why he was not capable of leading the Israelites to the Promised Land, God molded Moses into a dynamic leader. This is a study that trains readers in Christian leadership. - Publisher Moses Moses began life in the water--and there he might have stayed. But God had a unique plan for Moses including a leadership training program devised to make sure he was fit for the challenge of leading the Israelites. Are you the leader God wants you to be? Are you willing to be trained? Let the story of Moses inspire you to a new level of dedication and service. The Chariot Victor Bible Character Series brings a real-life perspective to Old and New Testament characters. Use this series on an individual basis or in a group setting. Personal and amp; Group Study Guide included Cleland Thom is a journalist and lecturer in journalism. He is the author of two other books and lives in England. About "Moses (Chariot Victor Bible Character Series)"
Moses Moses began life in the water--and there he might have stayed. But God had a unique plan for Moses including a leadership training program devised to make sure he was fit for the challenge of leading the Israelites. Are you the leader God wants you to be? Are you willing to be trained? Let the story of Moses inspire you to a new level of dedication and service. The Chariot Victor Bible Character Series brings a real-life perspective to Old and New Testament characters. Use this series on an individual basis or in a group setting. Personal and amp; Group Study Guide included Cleland Thom is a journalist and lecturer in journalism. He is the author of two other books and lives in England.